Thank you to everyone who came out in support of Sturgeon Bay Public Art and our amazing artists at the 18th Annual Street Art Auction on September 15. 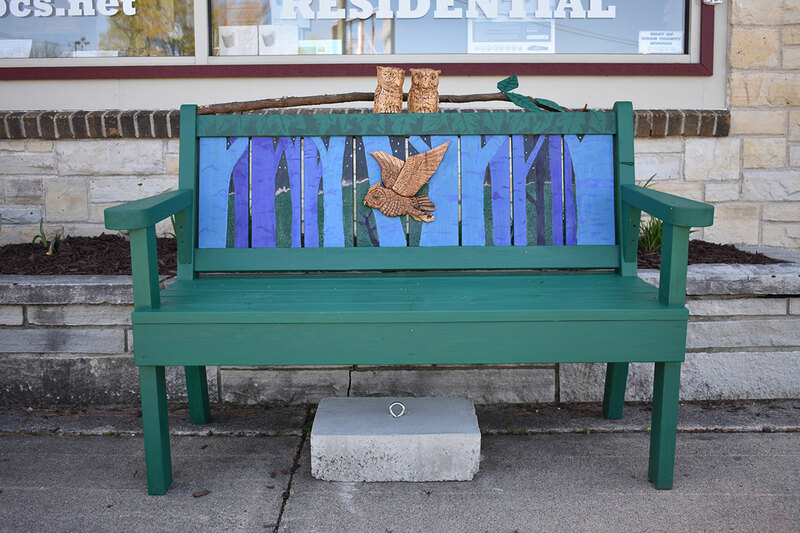 Because of you and the generosity of our title sponsor and member partner sponsors, Sturgeon Bay's Public Art programming continues to grow and thrive! 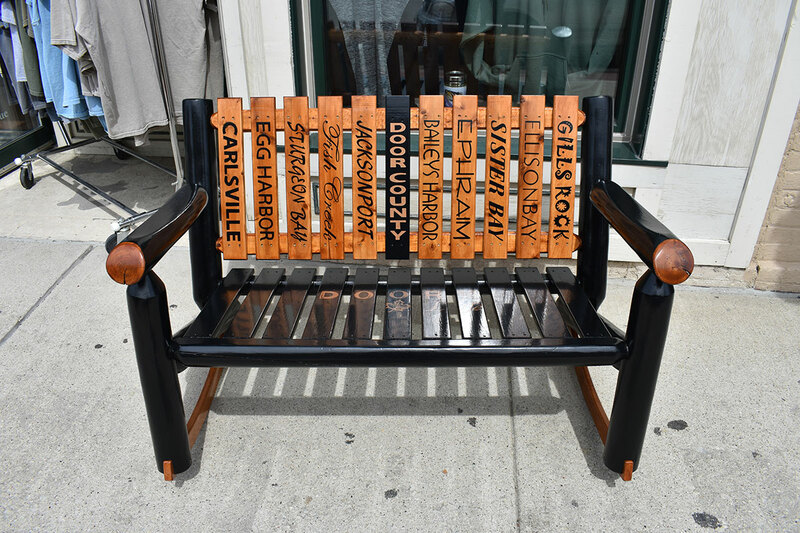 Bench Location: Artists Guild - 215 N. 3rd Ave.
“Art - the expression or application of human creative skill and imagination. Studio - a room where an artist works. 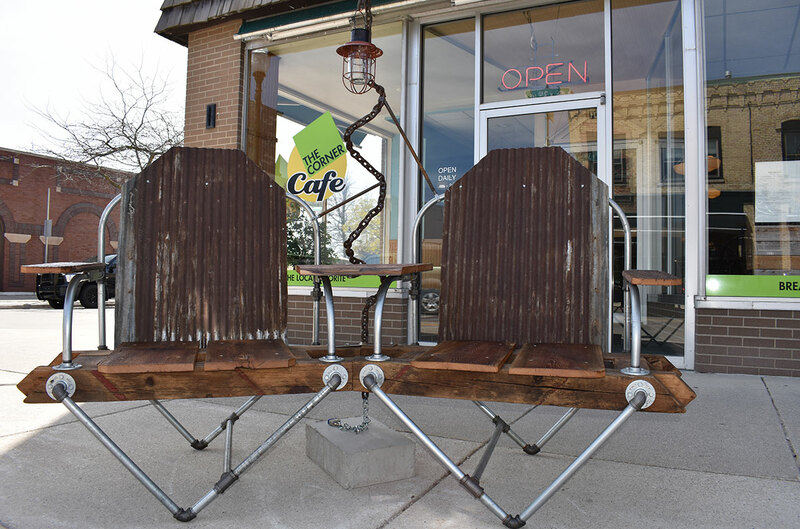 Bench Location: The Corner Café - 113 N. 3rd Ave.
"Electricians, plumbers, farmers, and lumberjacks have been around for many years. These sought after trades are what made Sturgeon Bay in the past and keep it going today. 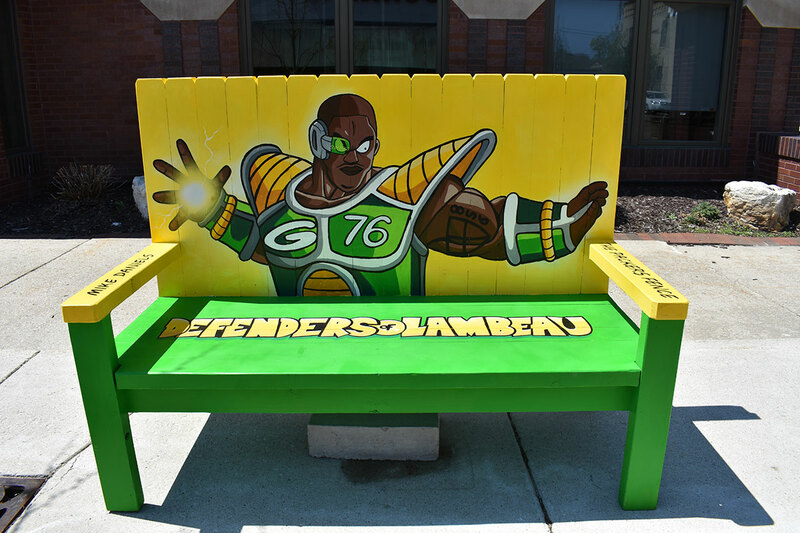 These are a few trades that are represented in this bench that you are relaxing on. 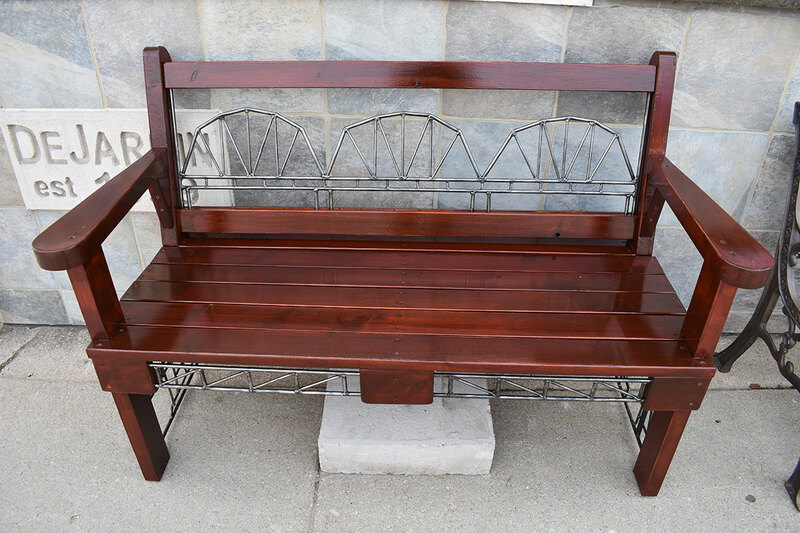 The materials used to make this bench are some of the materials used in the trades today and in the past. Electrical rigid conduit and threaded pipe fittings make up the framing of the bench. The wood framing is reclaimed pine beams with hemlock barn siding for the seat while the back rest is old barn tin roofing. The chain represents the lumberjacks that harvested the vast amounts of wood for building the barns that made Door County what it is today. 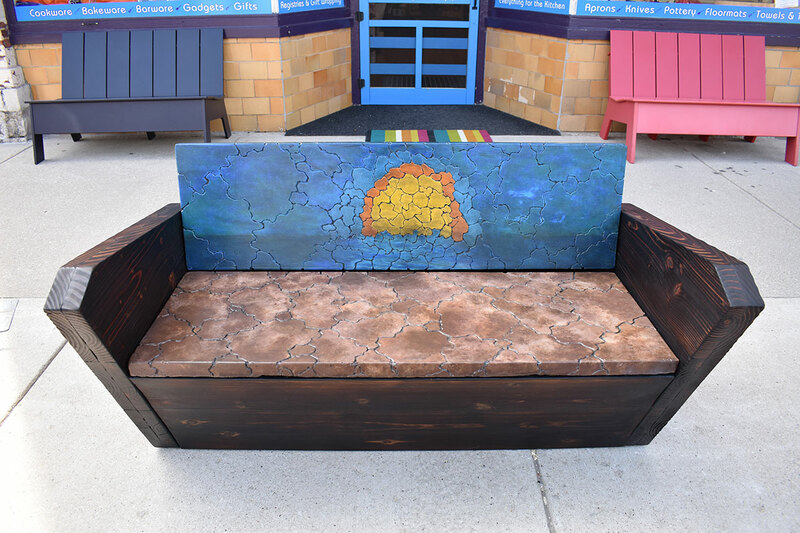 Bench Location: Cornucopia Kitchen Shop - 139 N. 3rd Ave.
"I have been a furniture designer in the Milwaukee area for nearly a decade. 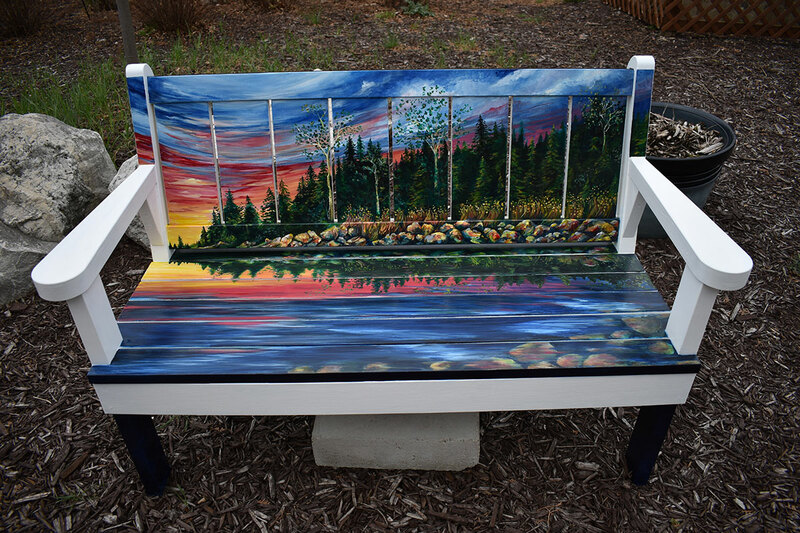 The overall inspiration for this bench - "Breaking Through" - was the rocky beaches and amazing sunrises seen over Lake Michigan. Another design inspiration was my love for classic wooden boats from the early to mid-20th century - that can be seen in the angled front and rear of the bench. 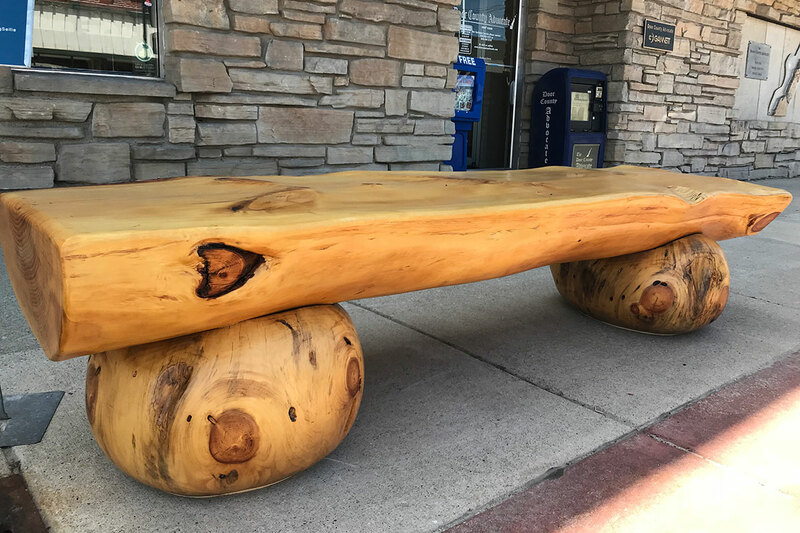 Bench Location: T. Simon Jewelers - 69 S. Madison Ave.
"I have decided to create a bench quite different from what we normally see on the streets of Sturgeon Bay. The beauty of the universe outside our earthly environs intrigued me. We have fun watching space movies and the places they take us through special effects. 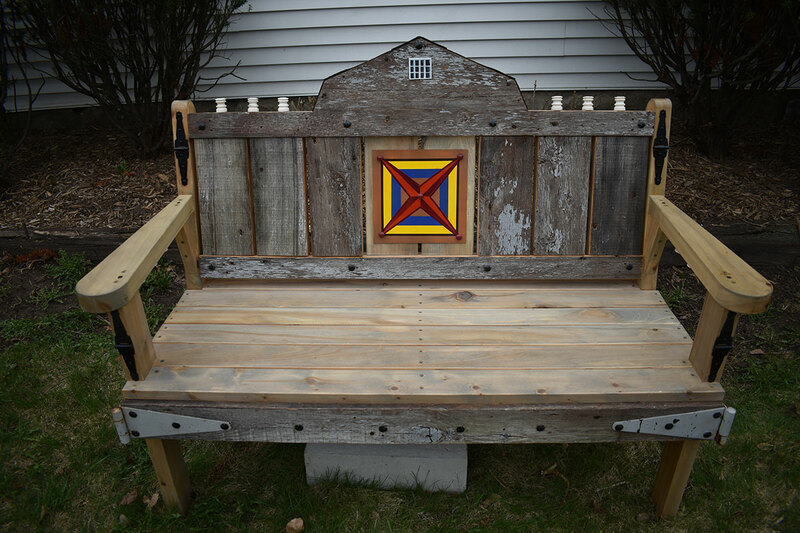 Bench Location: Cutting Boards and More - 611 Jefferson St.
"When traveling through Door County, the country barn, be it still functional or in disrepair, is always a reminder of a different time and lifestyle from today. It brings to mind those "back in the day" moments that make you smile. Bench Location: Associated Bank - 57 N. 3rd Ave. 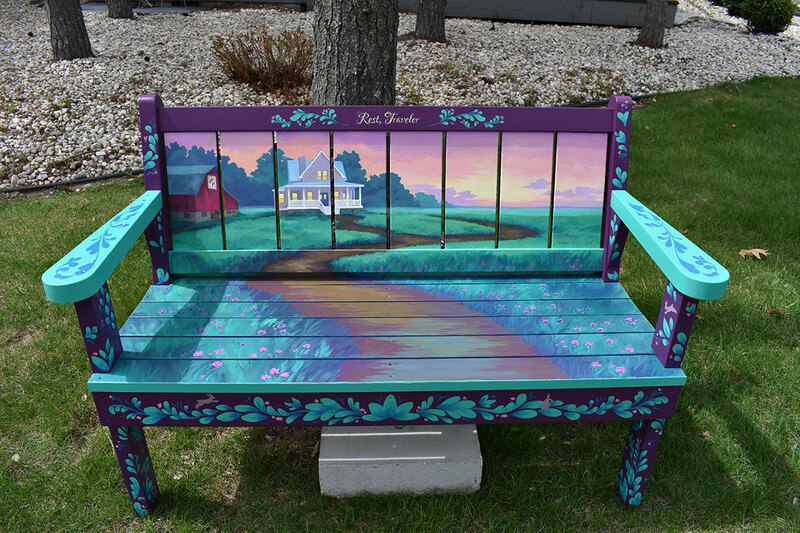 Bench Location: Holiday Music Motel - 30 N. 1st Ave.
"This is the second year for Benches by the Bay event in Sturgeon Bay and I am honored that I was selected as one of the 25 artists to create a bench. 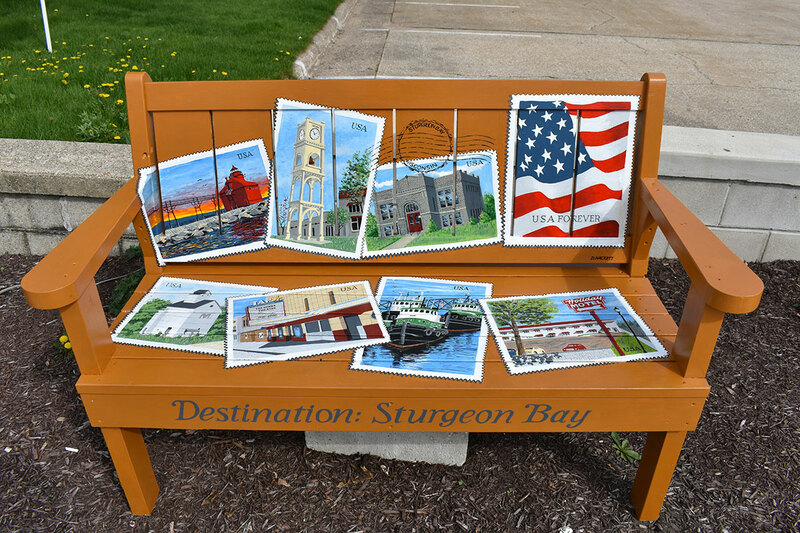 This year's edition of the bench design in my case was developed after the considerable amount of thought about what it is that is special to me about this great town of Sturgeon Bay. Now, how best to showcase them was my challenge. I have always been enamored of the U.S. Postal stamps with their portrayal of famous people, events, autos, sports, holidays, etc. via art and/or photography. One of the recent stamp editions I admire is the American flag with the words 'USA FOREVER' subtly emblazoned across it. I like that. It reminds me of how lucky I am to live in this fabulous country. So, the answer to my challenge was clear. Bench Location: Bliss - 724 Jefferson St. Check out the fountain in action! 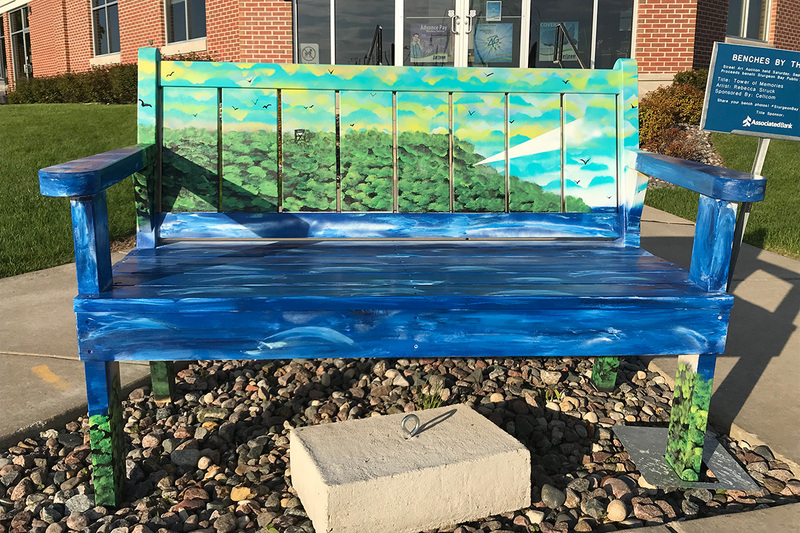 "I was approached by the SBVC about Celebrate Water Door County and how great it would be if I would incorporate water into this year's bench design as a kick off to this event. Over the past year I have been working with recycled tempered glass, and through trial and error, found a way to bend tempered glass to create the illuminated focal point of the bench. 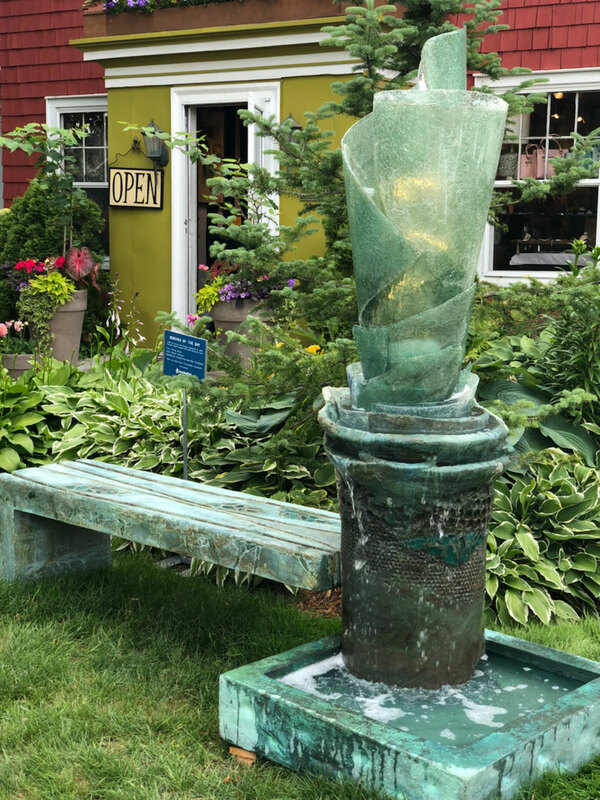 The bench itself, along with the water reservoir and the pedestal that holds the glass sculpture, is constructed out of glass fiber reinforced concrete. The three pieces are relatively light weight and can fit together in a variety of ways to work in anyone's landscape. Grooves in the bench were created by casting the concrete over bamboo poles along with pieces of glass that are illuminated with LED lights. 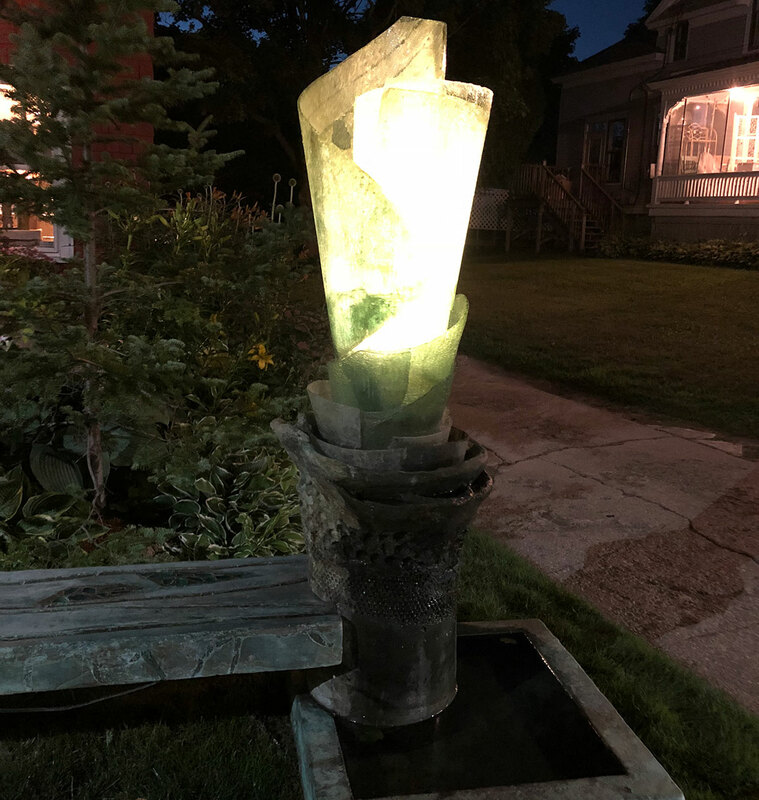 Water goes through this tapered cylinder sculpture of glass and falls over a light source that is in the center causing a cool effect at night. 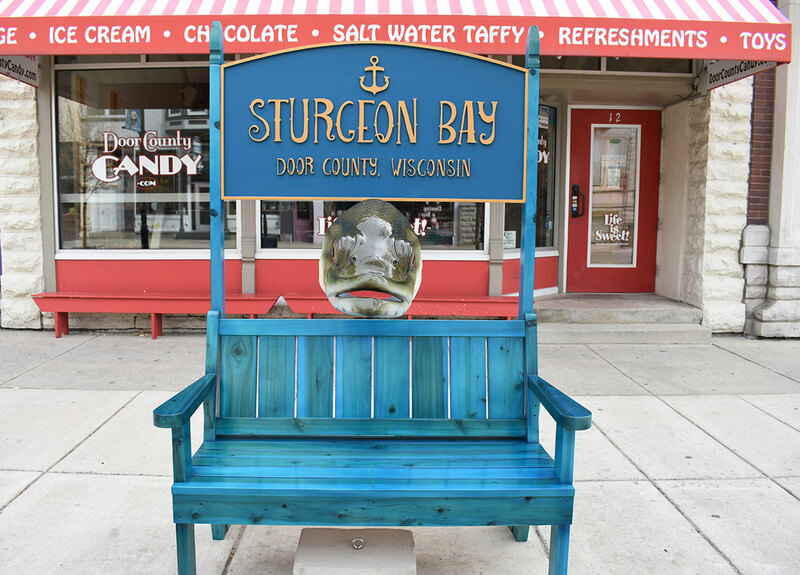 Bench Location: Door County Candy - 12 N. 3rd Ave.
"The idea for the "Fish You Were Here" bench came from thinking about a way to connect Sturgeon Bay's past with today's tourist driven economy. Fishing has always played a major roll in the history of the area and continues to be important. I wanted to create a photo opportunity that was so fun that people would share it on social media. People with big goofy fish heads? I can't think of anything that would be more fun than that! I don't really consider myself an artist, at least not yet. Although my career as an exhibit designer and fabricator requires artistic skills, I've always thought of myself as more of a technician. 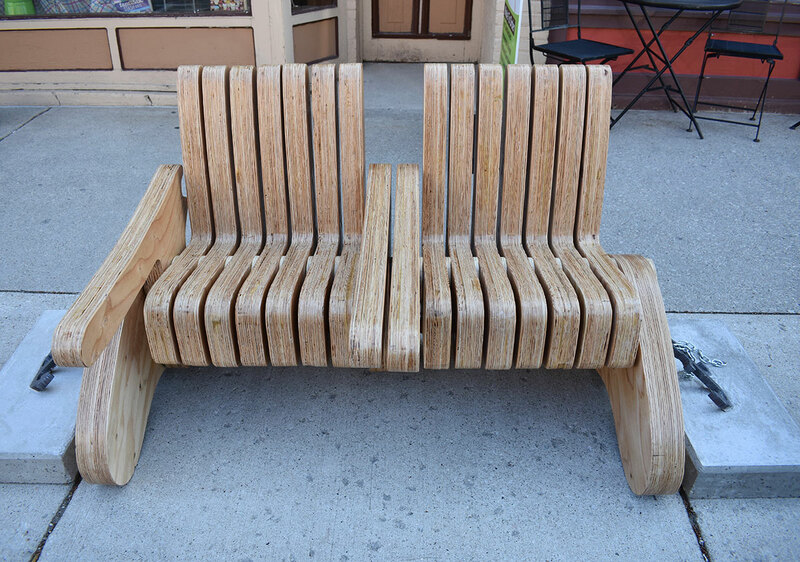 Bench Location: Door County Advocate- 235 N. 3rd Ave. 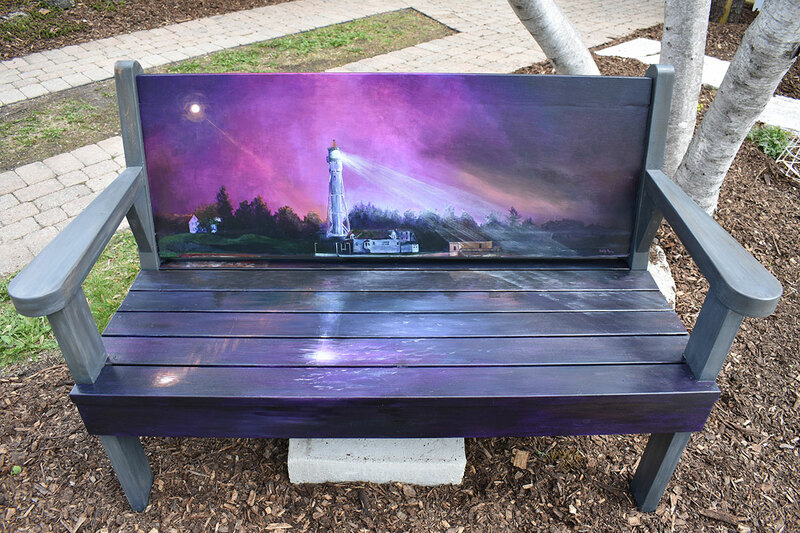 Bench Location: Monticello on Jefferson - 715 Jefferson St.
"The inspiration for this bench painting came from the Van Morrison song, "Into the Mystic." I pictured the Sturgeon Bay Shipping Canal Light in a night scene. The mysterious, but yet romantic feel when the ships are entering the unknown with the guidance of the lighthouse. Bench Location: Kick Coffee - 148 N. 3rd Ave.
"I am a carpenter by trade. I have experience working in both wood and concrete- adding my own inspiration and special touch to items I make. I wanted to make a clean, yet rugged looking bench - that wasn't only a bench. I saw this idea and was inspired by the versatility of the design. It was a challenging and fun project. Bench Location: Quantum PC Services - 619 N. 8th Ave. Bench Location: On Deck Clothing Company, - 265 N. 3rd Ave. 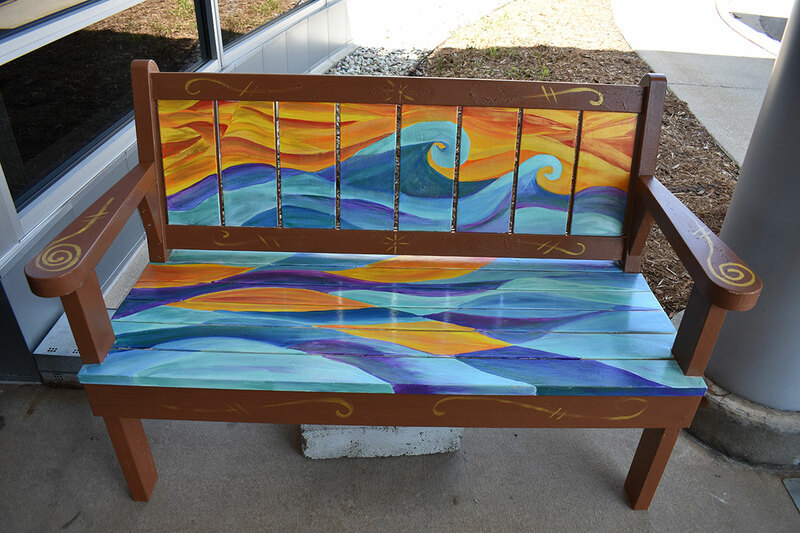 Bench Location: Culver’s of Sturgeon Bay - 5581 Gordon Rd. "Art has always been an essential part of my life. My art is inspired by nature. I love to paint landscapes, water, and moody skies. I typically paint with watercolor because I love how the paint rushes across the page in tandem with my busy hand to create my impressions of what inspires me. Bench Location: Door County Medical Center- 323 S. 18th Ave. Bench Location: Bay Shore Inn - 4205 Bay Shore Dr.
"Recently I have returned to the U.S. after living abroad for nearly four years. As I have returned to Wisconsin and begun the task of resettling, I've been contemplating the idea of "homecoming." As much as I love the countries I've lived in and visited, for me there is nothing quite like the feeling of returning to Wisconsin and traveling familiar country roads. 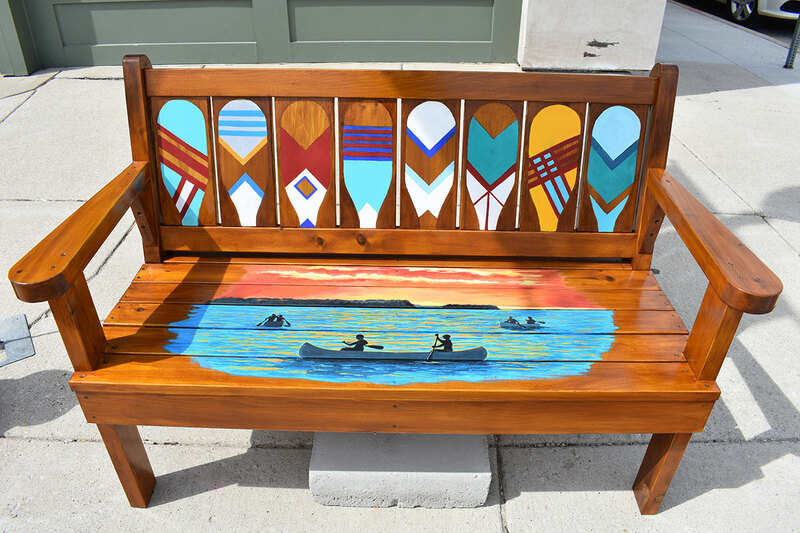 Bench Location: DeJardin Cleaners - 24 N. Madison Ave.
"This bench is designed to showcase the storied and diverse history of Sturgeon Bay. 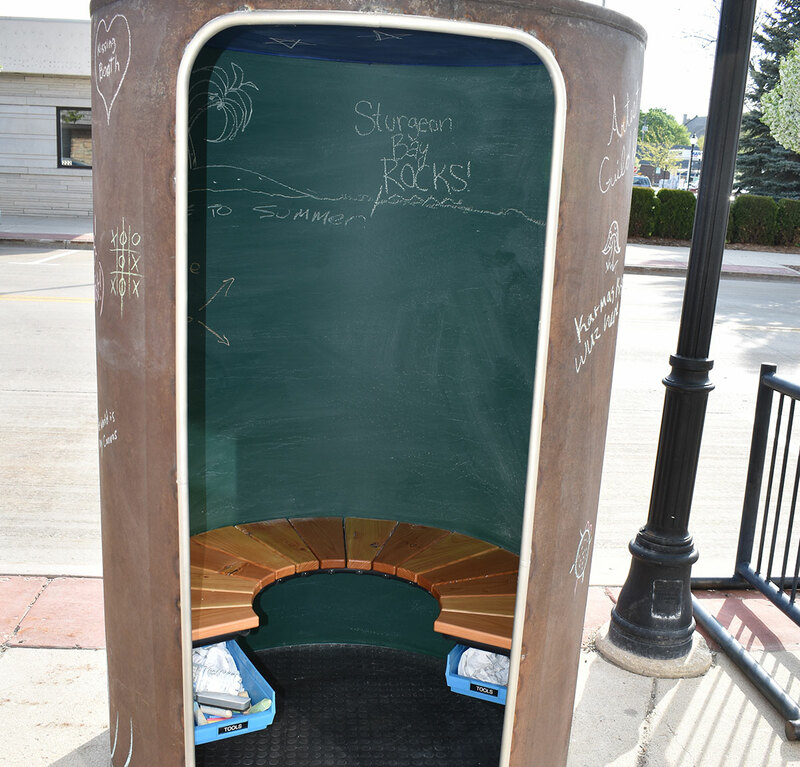 The images depicted evoke the many facets of what makes Sturgeon Bay the place it is today. 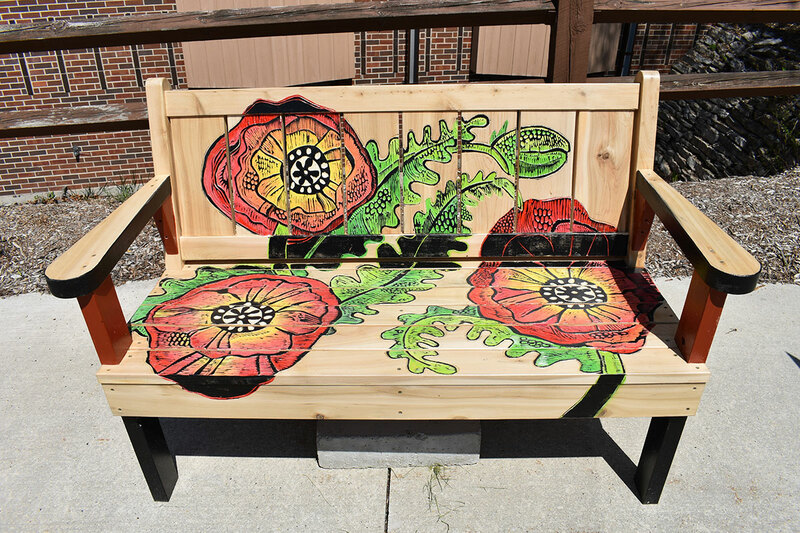 Bench Location: Sturgeon Bay Health Services - 200 N. 7th Ave. Although benches are certainly a welcome addition to any streetscape, I think they are especially suited for gardens. 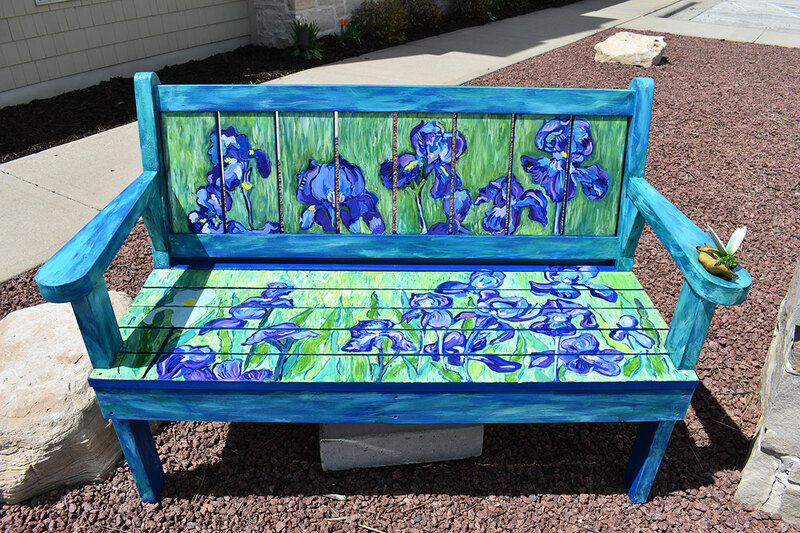 So when I designed my bench, I was inspired by some of my favorite garden flowers: poppies. 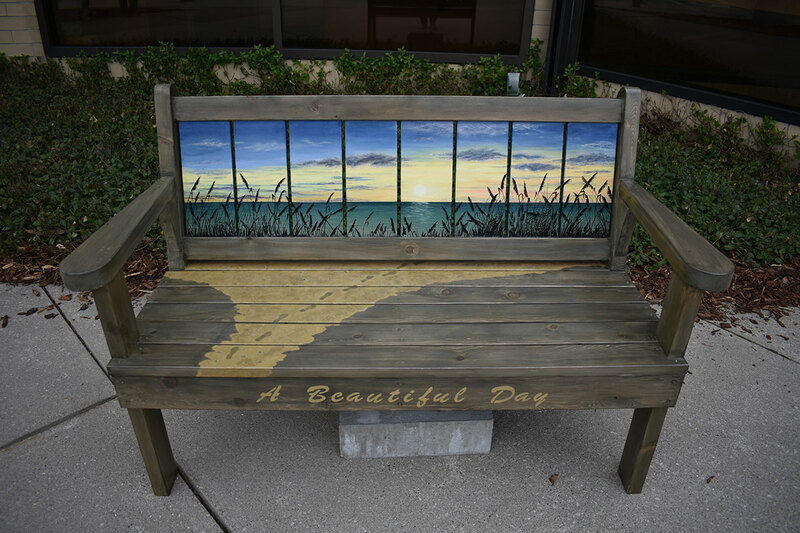 Bench Location: Nicolet National Bank - 217 N. 4th Ave.
"To me, sunrise is the most beautiful time of the day. It offers serenity and hope; a time to collect your thoughts while planning out your dreams before the rest of the world wakes up. The beginning of a new day allows for a fresh start. 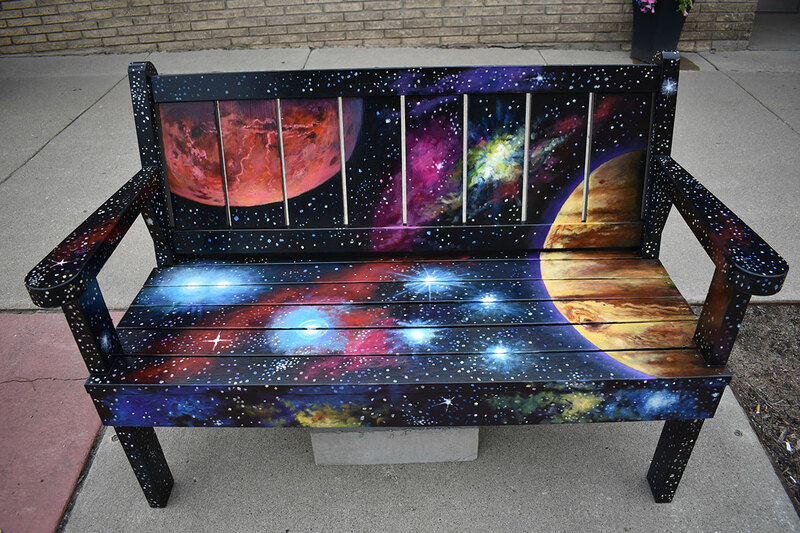 Bench Location: Cellcom - 7 E. Maple St.
"I used spray paint cans to create the painting on the bench. It pictures the 1932 Potawatomi State Park tower peeking out of the tops of the trees of the scenery of Sturgeon Bay that holds memories for many tourists over the years as well as locals. I remember climbing it myself from a very young age. Unfortunately, it is being dissembled. I chose to paint the tower to raise awareness for the funds needed to keep the memories alive looking to the future to build a new one. If you follow me as an artist, you will know I have done more than one donation piece for the Peninsula State Park Eagle Tower fund raising. Bench Location: Shirts N Bay & More- 160 N. 3rd Ave. Bench Location: Dancing Bear - 13 N. 3rd Ave. Bench Location: Stone Harbor Resort & Conference Center- 107 N. 1st Ave.
"This is my rendition after Van Gogh's famous painting. What inspired me about doing this was that he created it as a peaceful outlet while he was trying to heal from his internal struggles at the asylum where he committed himself. This became an art therapy piece. 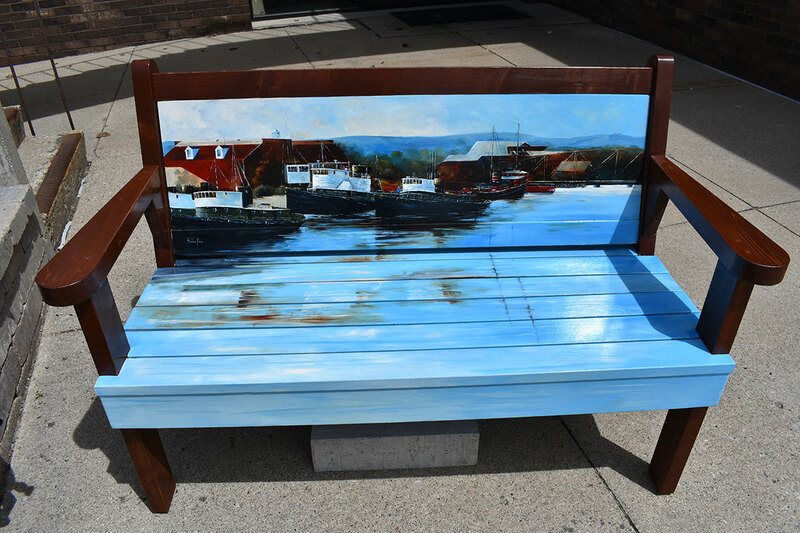 Bench Location: ERA Starr Realty- 14 S. 3rd Ave.
"The maritime life of Door County has added richness to the overall history of Door County. The tugboats of Sturgeon Bay are an integral part of this rich history. 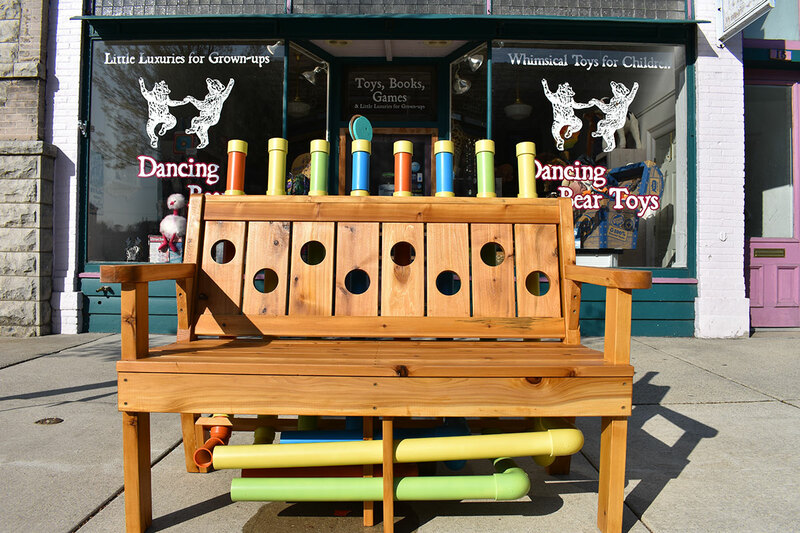 The name of this bench, "The Working Class," pays tribute to the important role of the tugs in the overall functioning of Marine Door County.